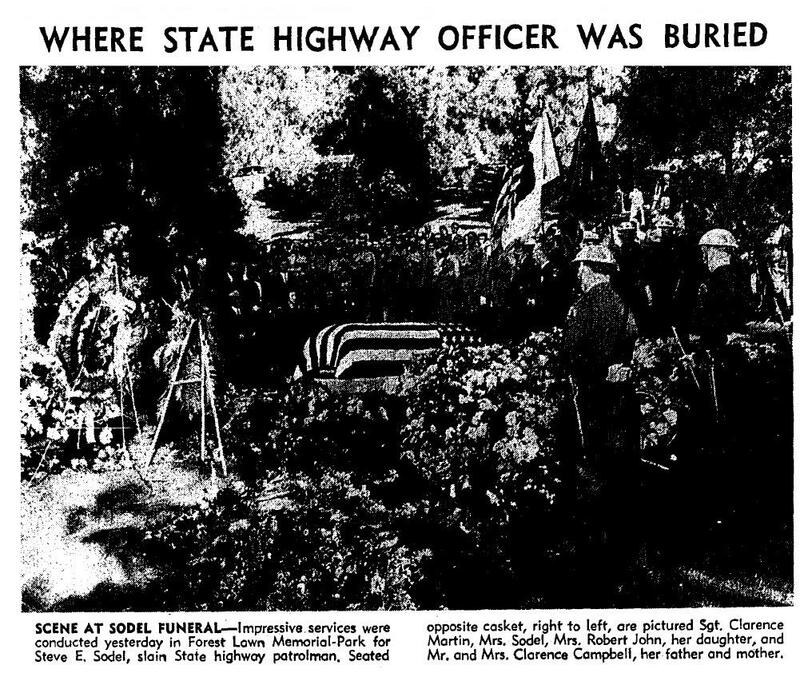 Nov. 4, 2013 -- On Tuesday, Sept. 17, 1946, California Highway Patrol Officer Stephen W. Sodel was on duty at a police safety checkpoint near Playa del Rey, on Jefferson Boulevard, about a half-mile east of Lincoln Boulevard –- then known as Theodore Roosevelt Highway, now Pacific Coast Highway. Sodel, 48, a 12-year veteran of the highway patrol, was working alone, checking passing cars to make sure their lights and brakes were working properly. It was a warm fall day in Southern California, with clear skies and temperatures reaching into the low 80s. Sodel and his wife, Frances, lived on West 77th Street in the Inglewood section of Los Angeles, after recently moving from Long Beach, where Sodel had worked as a machinist and pipe fitter for Shell Oil. Sodel later worked at Craig Shipbuilding Co. in Long Beach. When the shipyard closed in the early 1930s, Sodel sold insurance before joining the highway patrol. 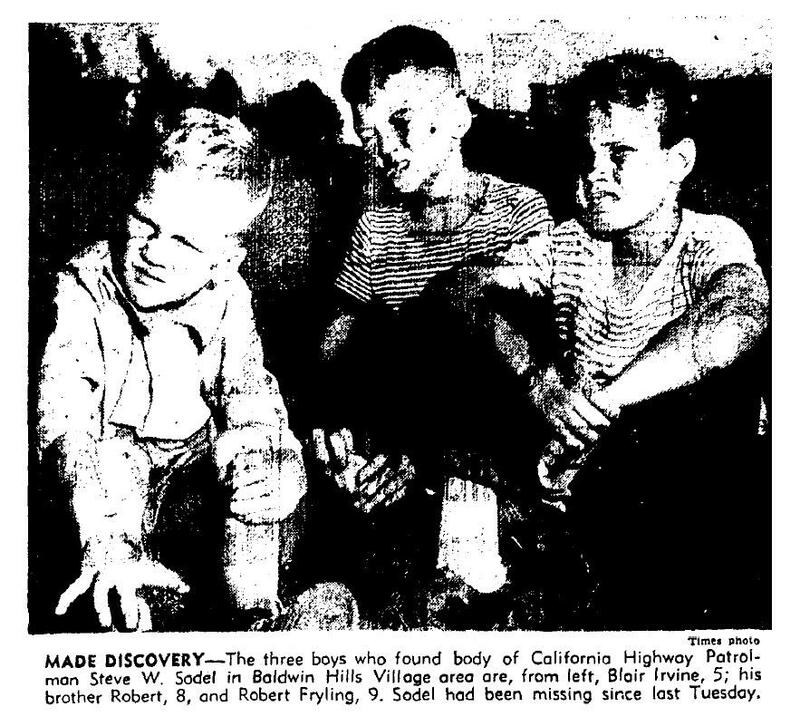 The Sodels lived in Inglewood with their 20-year-old daughter, Barbara, and her husband, Robert B. Jahn, 24. At about 3 p.m., when other CHP officers arrived at the safety checkpoint, they found Sodel's black-and-white patrol car, with the keys in the ignition and the police radio on, but Sodel was nowhere to be found. About 40 feet behind his patrol car, they found heavy skid marks, indicating that another car had stopped quickly at the scene, and then sped quickly away. If Sodel had been attempting to get a driver to pull over and stop, he would have typically turned on his lights and siren, and stopped behind the other car. It would have been unusual for him to stop in front of the other car -- unless the driver ignored his lights and siren. In that case, Sodel might have decided to drive in front of the other car, forcing it to stop. Police officials suspected that Sodel had stopped a car for some violation, and had been kidnapped. 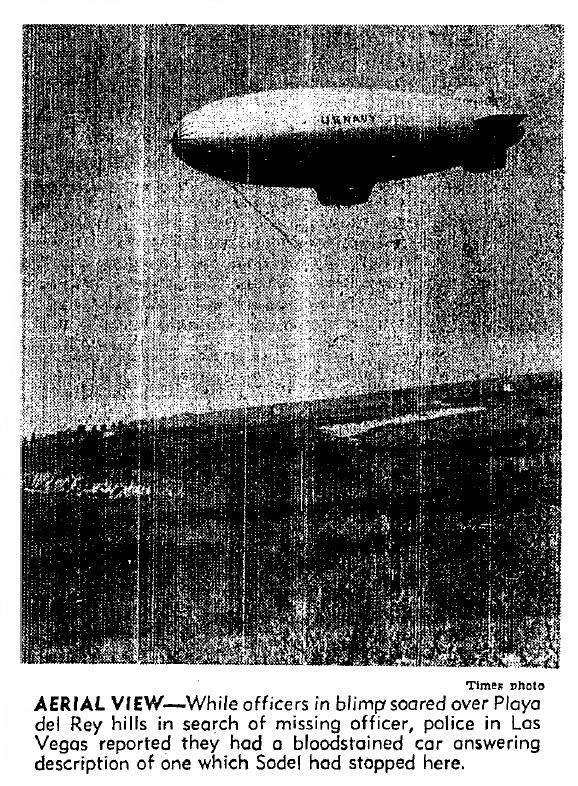 A state-wide search was launched that evening, and more than 150 police officers, two search planes and a Navy blimp combed the area around the scene, but no trace of Sodel was found. "We've covered everything we can at present with the information we now have," said CHP Investigator Russell H. Emmett. "We must now await more definite clues." Witnesses told police that they had seen Sodel talking to the driver of a dark-colored Chevrolet sedan, which was parked behind his patrol car, shortly before the other officers arrived and discovered Sodel missing. Another witness, Jack Singleton, told police that he had towed a Chevrolet sedan early Tuesday after the car had gotten stuck in the sand at Playa del Rey. He became suspicious when he noticed that the car had been recently painted black, and the license place had been partially painted over. Singleton said he saw Sodel at about 2 p.m., shortly after he towed the car out of the sand, told him what he had seen, and described the car, which Singleton suspected had been stolen. Sodel then took off in his patrol car, in pursuit of the suspicious vehicle. Other witnesses told police that they had seen a CHP patrol car chasing, then pulling over a car that matched the description of the black Chevrolet sedan. Three days later, on Sept. 20, police found a bullet-riddled, blood-stained black Chevrolet sedan which matched the description given by the witnesses, abandoned near Las Vegas. The car had at least one bullet hole through the trunk. Police checked the car's identification number, and found that it was owned and recently reported stolen by Jeanne A. Trude of Los Angeles. Trude told police that, on Monday evening, Sept. 16, she met Albert A. 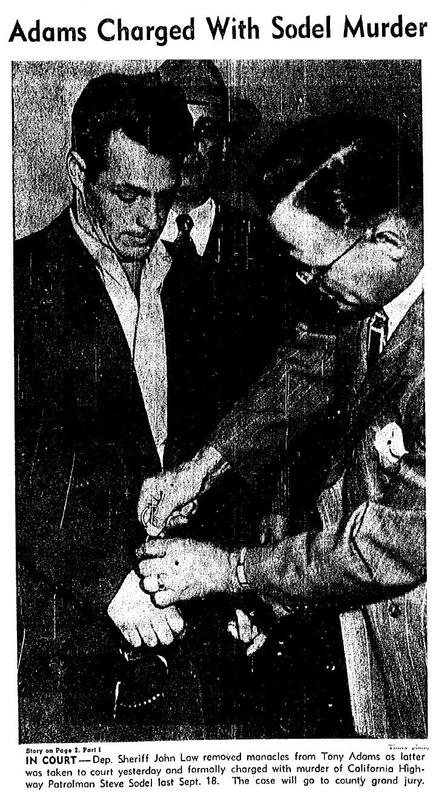 "Tony" Adams, a 26-year-old recently unemployed house painter, at a wedding party at the Jococo Club on Sunset Boulevard. Trude then drove Adams to Dave's Blue Room, another nightclub on Sunset. Shortly after they arrived at Dave's Blue Room, at about 1:30 a.m., Adams excused himself, left Trude alone at their table -– and never came back. Trude eventually left the nightclub, and discovered that her gray Chevrolet sedan was also missing from the nightclub parking lot, and she reported it stolen. At the time, Adams, who had served time for grand larceny in New York, was absent without leave from Fort Rucker, a U.S. Army post in Alabama, since May 1944. When police found Trude's car in Las Vegas, it has been freshly painted, and had new license plates. Fingerprints on the car were matched to Adams. Inside the car, police found scraps of paper containing police information that was routinely furnished to highway patrol officers, but no trade of Sodel. An autopsy showed that Sodel had been shot five times at point-blank range -– three times in the chest -– and his skull was fractured. Investigators theorized that he was hit over the head and knocked unconscious, then shot to death. His service revolver and handcuffs were missing. Tire tracks at the scene where Sodel's body was found matched the tracks found behind Sodel's patrol car, and also matched the car found in Las Vegas. The .32-caliber bullets found in Sodel's body matched the bullets found in the abandoned car. 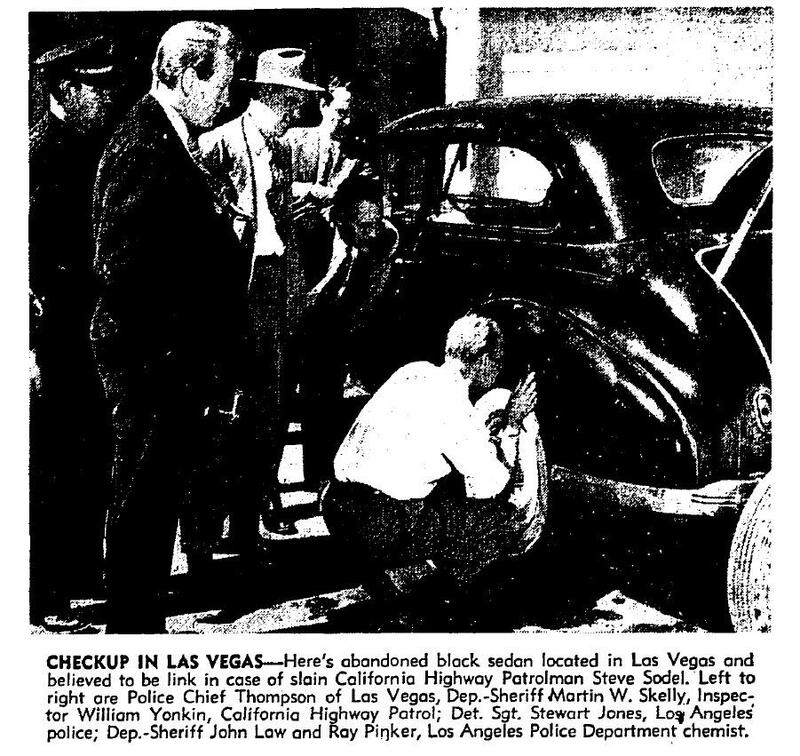 Since the car was discovered in Nevada, and the investigation crossed state lines, the U.S. Department of Justice became involved, issuing a complaint against Adams for unlawful flight from prosecution on a murder charge, and transportation of a stolen car across state lines, and launched an intense nationwide search. While the search for Adams continued, Sodel was laid to rest at Forest Lawn Memorial-Park in Glendale. The funeral services were attended by California Gov. Earl Warren, Los Angeles County Sheriff Eugene Biscailuz, Los Angeles Police Chief Clemence B. Horrall, high-ranking police officials from more than a dozen Southern California cities, and more than 200 police officers. On Oct. 7, Adams was arrested in New York City, where he was discovered listening to the World Series game between the St. Louis Cardinals and the Boston Red Sox on the radio at a friend’s apartment. When FBI agents and New York City police officers knocked on the front door of the apartment, Adams ran out the rear door and jumped from the second floor, but was caught after a short chase. FBI agents had been watching the homes of Adams' friends in New York City for several days before the arrest. 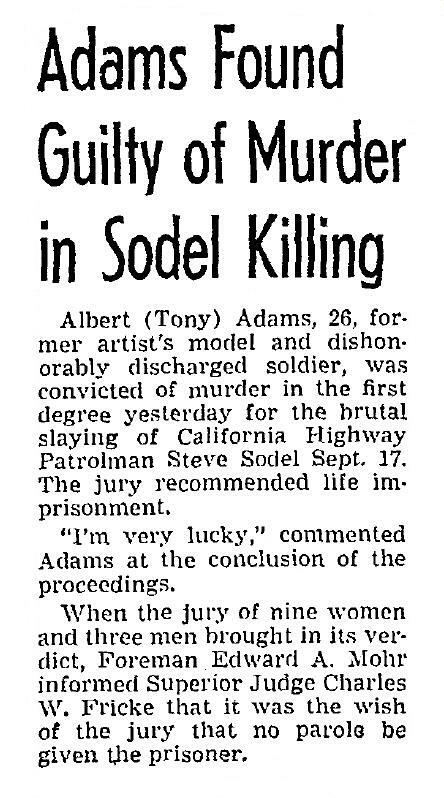 In New York City, Adams admitted to police that he fled Los Angeles after stealing Trude's car, admitted that he abandoned the car in Las Vegas, and that he had recovered from a drunken stupor to find Sodel's cap and gun in his hands, which he disposed of. But he denied killing the officer, and offered no further details of the events of Sept. 17. Adams was brought back to Los Angeles, and charged with murder and car theft. He attempted to lead police to where he had disposed of Sodel's cap and gun, taking them to several locations in the Los Angeles area, but without success. In attempting to remember the events of Sept. 17, Adams told police, his "mind went blank." "I have confessed to nothing," Adams told reporters in Los Angeles. "I'm innocent of the charge and with God's help, the world will soon know it." 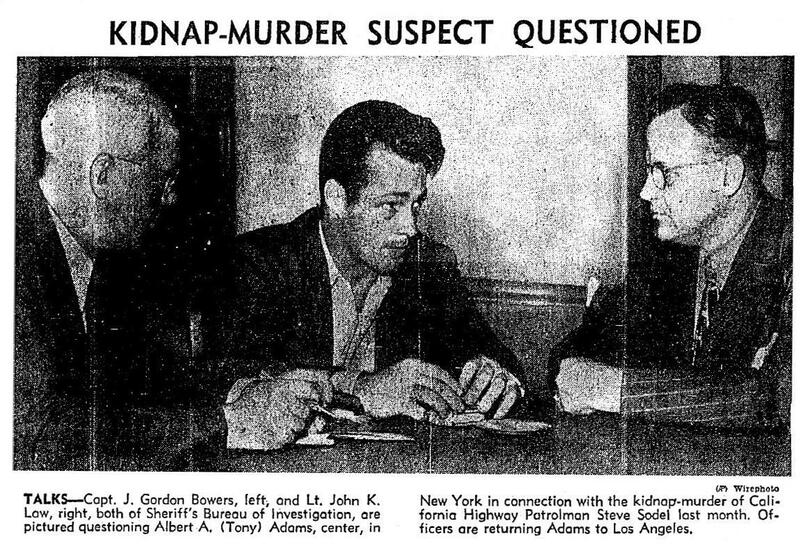 Adams' trial started on Jan. 7, 1947. On the witness stand, Adams continued to deny killing Sodel, and also denied stealing Trude's car. He said he left the nightclub because he realized that he didn't have any money and he was embarrassed, and that he spent the following afternoon –- the time prosecutors said Sodel was abducted and killed -– at a bar on Vermont Avenue. At the end of his trial, which lasted less than two weeks, the jury of nine women and three men deliberated just four hours before finding Adams guilty of all charges. Although the prosecution recommended the death penalty, the jury recommended life in prison without parole. "I'm very lucky," Adams said after the verdict was announced. "I am satisfied with the jury's verdict. My attorneys, Richard E. Erwin and William Turner, have given me a fair shake. I’m very lucky." After Adams was formally sentenced to life in prison by Judge Charles W. Fricke, Turner said that, on his client's request, he had no plans for an appeal. "I think that decision is a wise one for this young man," Fricke said. "Another jury, hearing the same evidence, might not be as lenient." It was later reported that the jury compromised on the life sentence after one of the jurors said she would hold out for as long as necessary rather than sentence Adams to death. 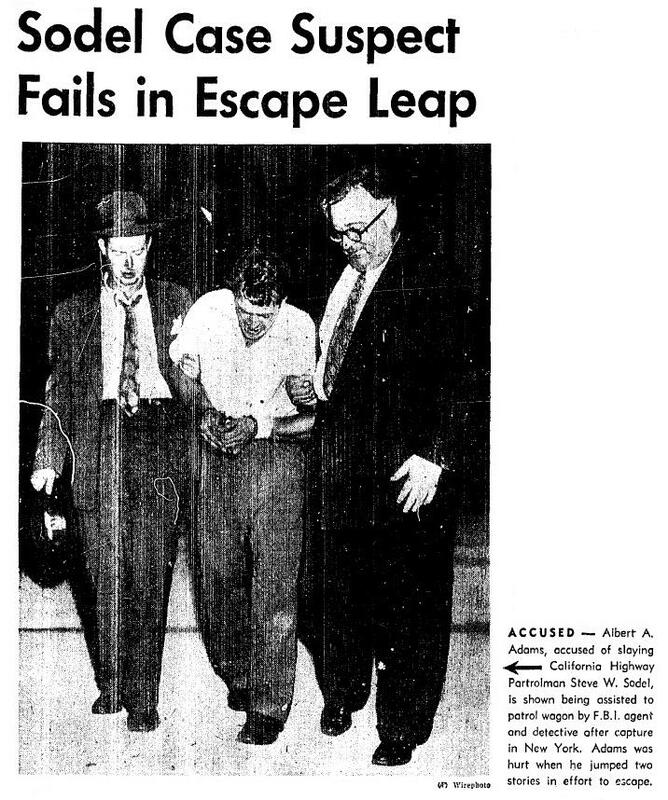 At the end of the trial, Adams was transferred to San Quentin State Prison to serve his sentence. 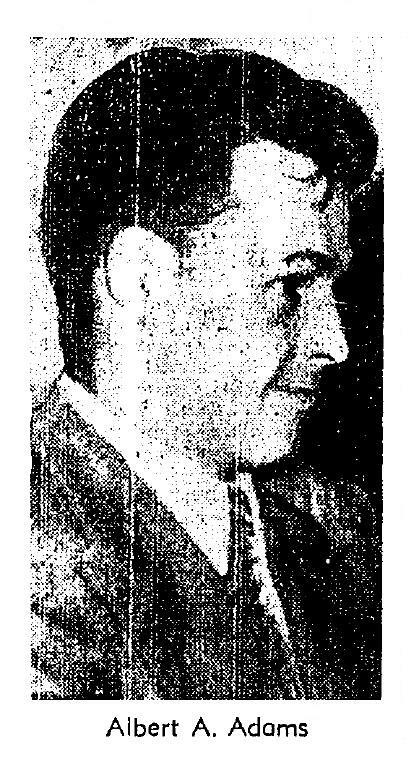 Eight years after Sodel's murder, in November 1954, his widow, Frances, married Sylvester I. Belden, a meat and provisions salesman, and moved to Torrence, Calif. Less than three years later, she was widowed again when her husband died in May 1957 at the age of 54. 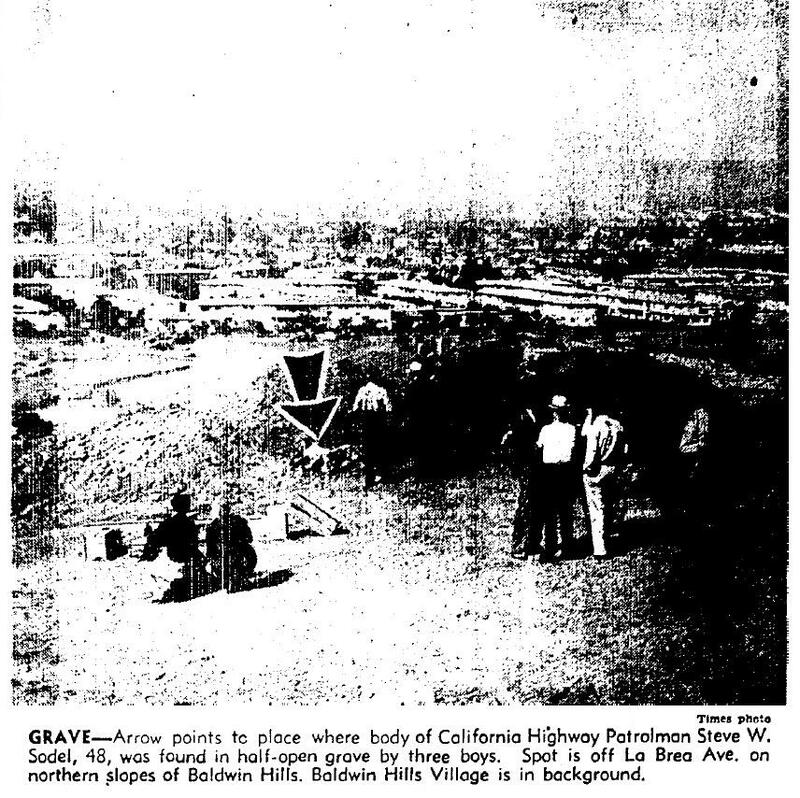 Sylvester Belden was buried at Inglewood Park Cemetery. 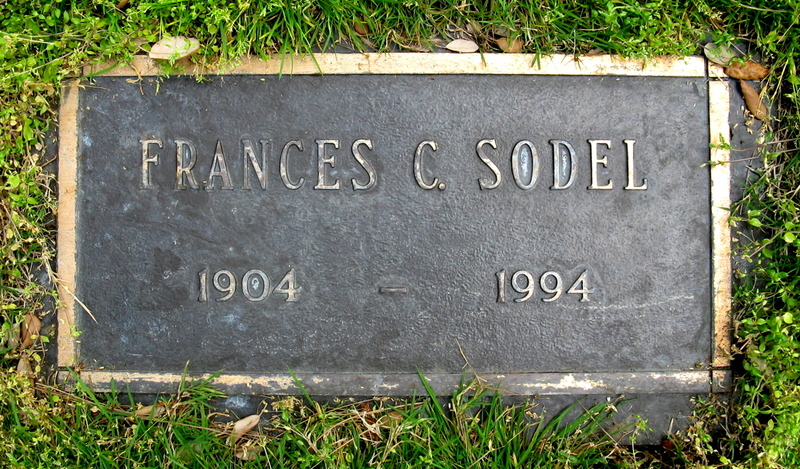 Frances Campbell Sodel Belden died in Torrence in January 1994, at the age of 89, and was buried next to her first husband at Forest Lawn. Their daughter, Barbara, died in May 1997, at the age of 71, and is buried at Green Hills Memorial Park in Rancho Palos Verdes, Calif.